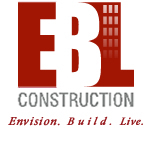 EBL has been awarded a renovation contract on the Stoneybrook Community Center in Estero, Florida. Excellent work by the EBL and Cinnabar Design Team! EBL is signing a contract tomorrow for the Immokalee Middle School Shelter Renovation! Stay Tuned! Eight Units Coming on Line with Snaidero Cucina “Time” Series in Walnut finsih.